I love living in a big city, but the thing I hate the most is not having room for a garden. At my current apartment, we don't even have a window box let alone a stoop or balcony where we can grow plants. 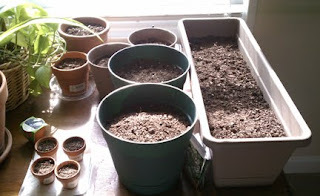 Instead we have a big table under our living room windows where our little pot garden flourished. We've been growing houseplants there for almost two years, but I miss the edible plants I used to be able to grow in my vegetable garden. 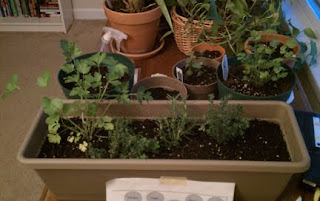 Last year I bought a box planter with the intention of making a kitchen herb garden, but I never did anything with it. Until now. A few months ago I did some research about what herbs grow well indoors, what can be planted in the same space and what needs its own pots. 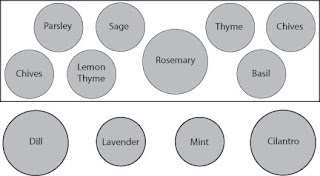 I also thought a lot about what herbs I use most often, what I'd like to use more and what would make our apartment smell good. I then plotted my little garden. 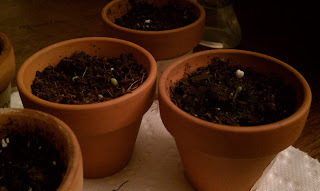 I prepped the soil and started some seeds in mini-pots. I thought about doing everything from seeds, but I don't have such a green thumb that I felt I could pull that off. So I only used seeds that I've either grown before or are hardy enough they should take off with little effort on my part. I made a trip to a local nursery and bought the remaining seedlings I needed to fill out my garden. Although it's not quite the same as digging my hands into the damp earth of sunny plot of land, I loved the smell of damp potting soil and the black dirt that embedded itself under my fingernails. After a week, I had lovely surprises popping up in my seed pots. Every day there were new little seedlings pushing through the soil. This week I used my first clippings from my little garden. I don't know if an omelet has ever tasted so good. I'm not one of those Midwest farmer's daughters the Beach Boys sing about, but I do understand the appeal of having your only piece of land to grow something that provides for yourself and your family.